Another type of FET transistor is the metal-oxide semiconductor Field-effect transistor (MOSFET). It operates on the same principle as the JFET transistor but uses the input voltage, applied across a built-in capacitor, to control the source-to-drain electron flow. 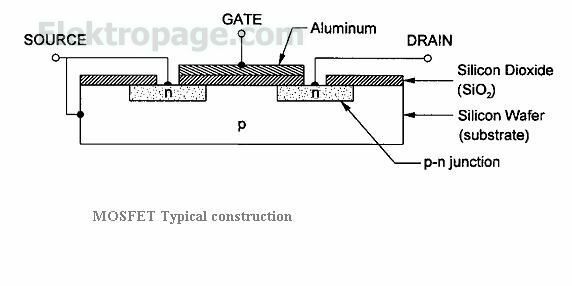 A MOSFET typically consists of a source and drain (n-type regions) embedded in a p-type material. The gate terminal is connected to a metal (aluminum) layer that is separated from the p-type material by a silicon dioxide (SiO2) insulator. This combination of metal, silicon dioxide (insulation), and p-type semiconductor layers forms a decoupling capacitor. The gate region is located between the source and drain regions, with a fourth region located under the gate, called the substrate. The substrate is either internally connected to the source or is used as an external terminal. The ?ow of electrons from the source to the drain is controlled by whether the gate has a positive or negative voltage. If the input voltage applied to the gate is positive, free electrons will be attracted from the n-regions and the pregion to the underside of the silicon dioxide layer, at the gate region. The abundance of electrons under the gate forms an n-channel between the two nregions, thus providing a conductive path for the current to flow from the source to the drain. In this case, the MOSFET is said to be on. If the input voltage at the gate is negative, the electrons in the p-region under the gate are repelled, and no n-channel is formed. Since the resistance in the p-region between the two n-regions is infinite, no current will flow, thus turning the MOSFET off. Although the MOSFET used in the above description was of an n-p-n type, a p-n-p type MOSFET can also be constructed, but its voltage polarities are reversed.